Today was expected to be a light air day, but it turned out to be a great day for racing! With the sun only hidden by a cloud here and there and the winds from 6-12 from the East, it was so much fun being on the water today. There were lots of shifts and if you followed them you made out well, if you didn't, you really were taking your chances. PRO Fairlie Brinkley and team worked hard to deal with the shifts that often happened right at the start. In the first 4-leg windward leeward race, the shift on the Championship Division start caused a postponement while the race committee waited for better conditions. The restart resulted in a general recall, but the third time's the charm, and the race was off. At first it looked like going left was the ticket, but then when the boats who went right met the boats on the left, they were together for the rest of the windward leg. The Challengers managed to start without incident and right was the way to go. Most boats went left but those who went right got to the windward mark first. One mistake and everything changed. The second race was also a 4-leg windward leeward race and once again the wind shifted on the start and up went the postpone flag. The restart was more civilized and the Championship Division was off. The fleet split and there were lots of tacks with the shifting wind. The Challenger Division got off without a hitch and playing the shifts was the answer once again. The lead boats did a good job of that and were far ahead of the rest of the fleet. After the first day the Championship Division has a 3-way 7-point tie. After the tie-breaker, the top 5 are Zeke and Jay Horowitz, Tyler Andrews and Andy Fox, Ryan Malmgrem and Stacy Rieu, Ned Johnston and Ryan Donahue, and David Ames and P. J. Buhler. The top 5 in the Challenger Division are Randy Rubinstein and Carol Claypool, Bill Vogler with Peg Woodworth and Carey Seven, Greg and Diane Kampf, William Schwarzschild and Mike Stephens, and Stephen Vincent and Stephen Vincent. There are 3 more days of racing in the series so anything can happen. Next up is the chalk talk with Zeke Horowitz, Tyler Andrews and Ryan Malmgren - which is always great when we hear from the leaders about what made them successful in this day's racing. We'll follow that with a nice dinner hosted by the club. 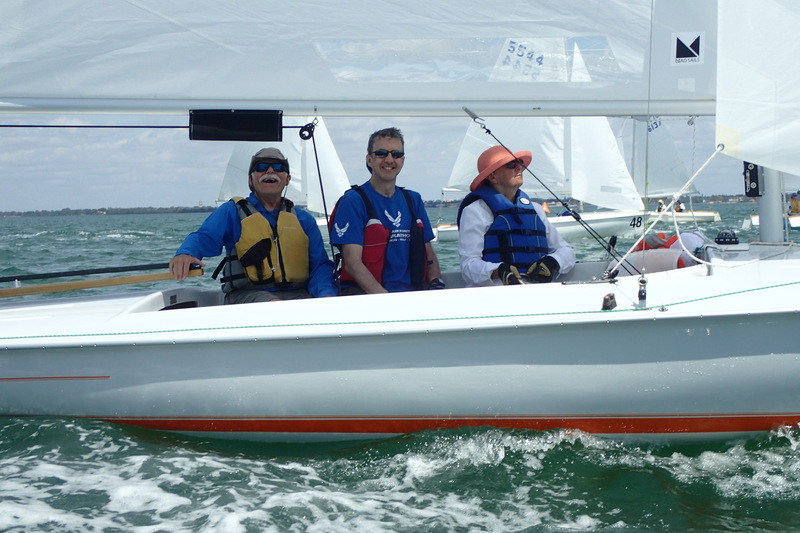 Thanks again to Sarasota Sailing Squadron for another fabulous day on the water. Full results are here. Photos are here.